A network is any collection of independent computers that exchange information with each other over a shared communication medium. Local Area Networks or LANs are usually confined to a limited geographic area, such as a single building or a college campus. LANs can be small, linking as few as three computers, but can often link hundreds of computers used by thousands of people. The development of standard networking protocols and media has resulted in worldwide proliferation of LANs throughout business and educational organizations. - You can share peripherals like expensive laser printers. - A file server can be used to store and share documents and files centrally. Computer resources like printers, modems, DVD-Rom drives and hard disks can be shared with the help of local area networks. This will reduce cost of hardware purchases. It is cheaper to use same software over network instead of purchasing separate licensed software for each client in a network. Data and messages can easily be transferred over networked computers. The data of all network users can be saved on hard disk of the server computer. This will help users to use any workstation in a network to access their data. Because data is not stored on workstations locally. Since, data is stored on server computer centrally, it will be easy to manage data at only one place and the data will be more secure too. 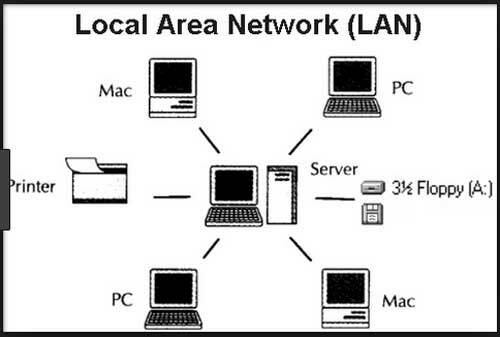 Local Area Network provides the facility to share a single internet connection among all the LAN users. In Net Cafes, single internet connection sharing system keeps the internet expenses cheaper. Although the LAN will save cost over time due to shared computer resources but the initial setup costs of installing Local Area Networks is high. The LAN administrator has the rights to check personal data files of each and every LAN user. Moreover he can check the internet history and computer use history of the LAN users. Unauthorized users can access important data of an organization if centralized data repository is not secured properly by the LAN administrator. Local Area Network requires a LAN Administrator. Because, there are problems of software installations or hardware failures or cable disturbances in Local Area Network. A LAN Administrator is needed at this full time job. Local Area Network covers a small area like one office, one building or a group of nearby buildings.